Leather tape is expensive and foam tape is too spongey for me; I like cotton tape because it’s strong, cheap, and just plain feels good on the hands. Newbaum’s is a relatively new company offering bar tape (and soon rim tape) in a great selection of colors cut and dyed, with eco-friendly dyes, here in Philadelphia. Keep reading for a (mostly) step-by-step pictoral. 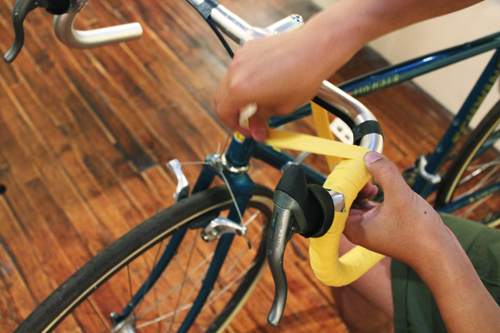 Start with a small piece of tape and cover the sleeve that holds the brake lever to the bars. 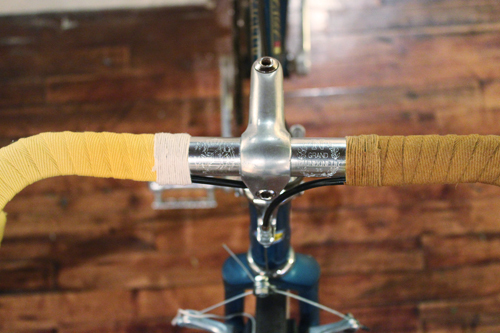 Start wrapping from the end of the bars and work your way up towards the stem. Cut off any excess tape and finish off with twine (directions), or if you like you can just use electrical tape. Personally, I like twine because it looks much better with the cotton tape and you can’t shellack electrical tape. Once you’ve got both sides wrapped and tied off it’s time for shellack. Shellack is just an extra step that keeps tape keep from getting soiled with dirt and so on. 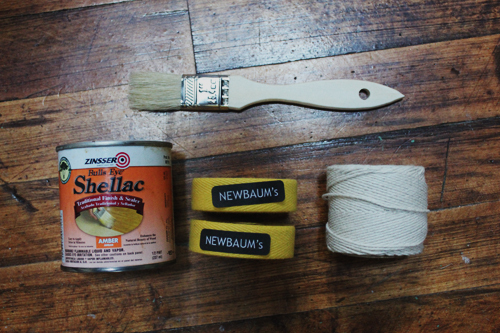 I’m using an amber shellack on the yellow tape in order to mimic the honey brown color of my Brooks saddle. Three coats yielded a pretty pleasing tone, though it could maybe benefit from another. There are more detailed steps involved than I care to document and more importantly others that have done a better job sharing. 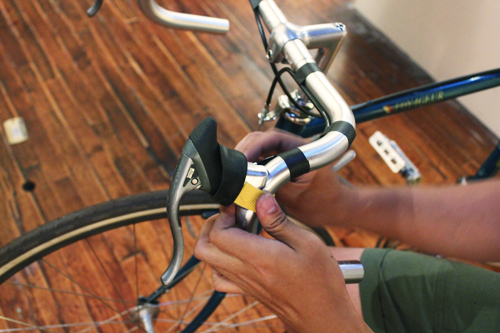 Rivendell Bicycle Works has a youtube page full of useful little tutorials, and one of them just happens to be on handlebar wrap and twine with a great Ethiopian jazz soundtrack- watch here. Looks great but what the hell! I thought the namesake of this blog would be the only way to go! Ha! This comment has come sooner than I would have anticipated, but I’m glad it was made! Different bikes need different kinds of bars depending on how it is intended on being used and different kind of bars need different kind of grip. 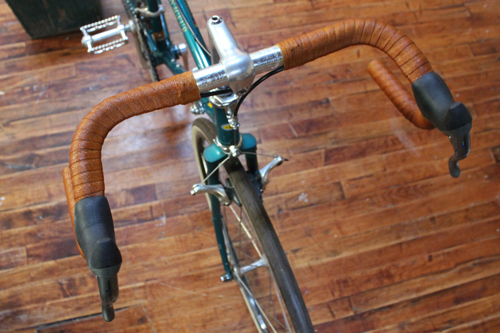 Cork grips on randonneur bars would be absolutely silly but you/I could use cork tape, even though it’s not really made of cork. i’ve seen some pretty well done harlequin wraps before, so crazy!